Yesterday was a beauty! How fortunate that it was also the day I was planning on meeting friends from the Washington Society of Landscape Painters at , what was for me, a new location on the banks of the Potomac and C&O Canal, Violette's Locke. This is my new favorite place on my favorite river! There were so many inspiring views to choose from. Broad views of the Potomac from high ground, views of the Canal and tow path and Locke #21, as well as small rocky beaches along the river. I chose the latter. I spent at least 15 minutes turning left and right trying to decide whether to paint the downriver view or upriver. Upriver had the advantage of a small waterfall, more rapid water and fallen timber. However, downriver meant my easel and palette would be out of the sun and also provided an enticing movement of water around rocks and the island between my location and the broader river. With such brilliant light I decided to save my eyes and take the downriver view. I was very happy with my choice. The sound of the rushing water was so soothing! There is very little left to do on this painting. I want to lower the tree line on the opposite side of the river and perhaps cool it down a little. The foreground greens need more yellow. In that bright light they seemed light enough but in the studio I felt just a few strokes of yellow here and there would be good. That will be all. I would like to return here soon! 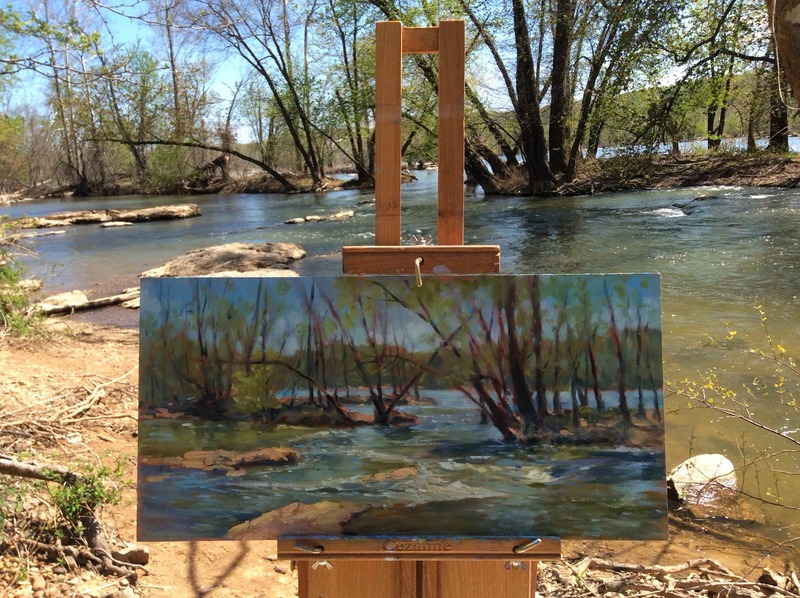 Here is another plein air painting of the Potomac. This one was painted last July at Great Falls. I have just varnished this one. I really like the long horizontal panels for my river paintings. 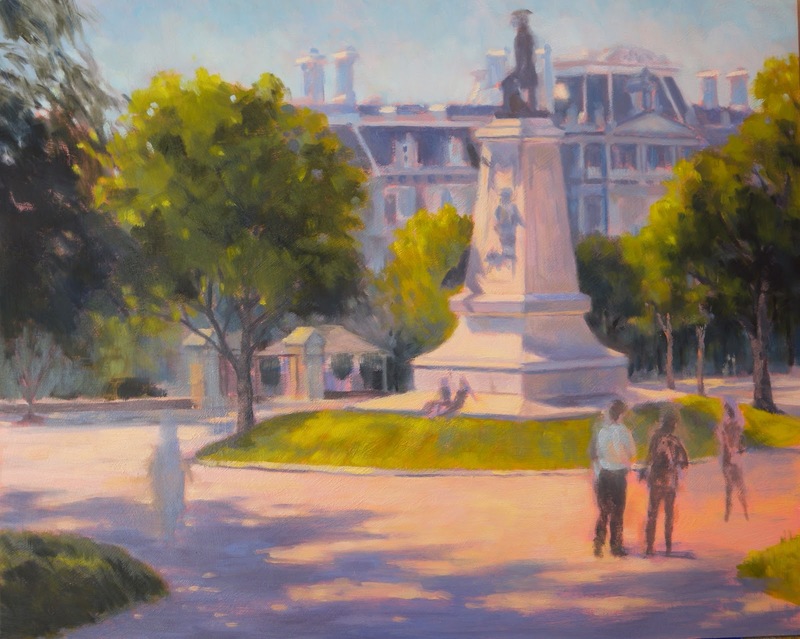 More Progress on "Lafayette Square"
Above is the most recent incarnation of my latest studio painting. I have been posting the progress of this one and that progress has been slow! I need to paint it while I have good natural light in the studio so I put it aside while we endured heavy rain and dark skies. The last two days have been sunny but quite cool so I am glad to be in the studio listening to music and getting back to work on this. The Eisenhower Executive Office building is a bugger to paint! I want it to read accurately but not be overly detailed as it would not then suit the painting. Tomorrow I will be painting parts of it out and trying again. 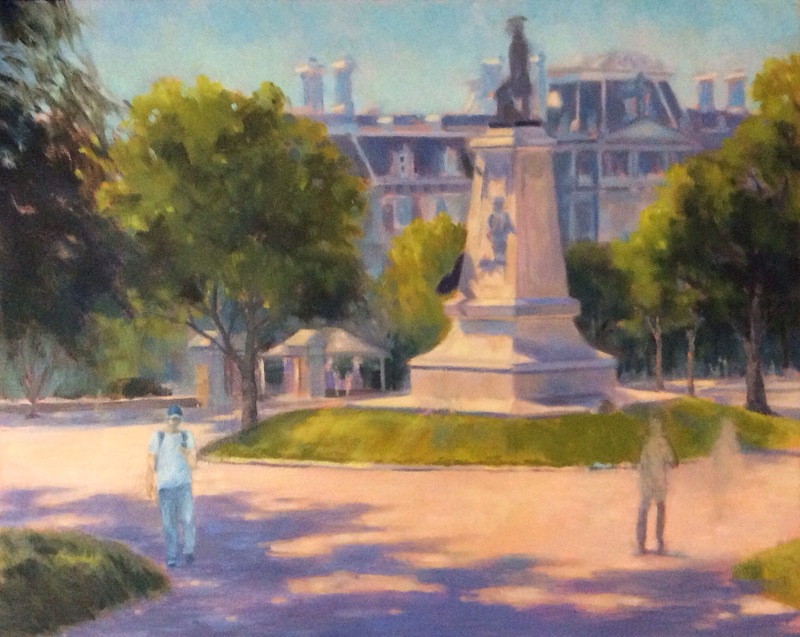 I will be adding more figures in the background and will have to decide whether or not to paint back in the figures I had sitting at the base of the monument. Happy Easter and Happy Passover to all of you who celebrate them! I painted this little study from life yesterday in my studio. It was a cold, windy, rainy, snowy, complete yuck of a day! I didn't want to continue work on "Lafayette Square" under studio lights so after a house cleaning frenzy, which included polishing silver, I had a sudden inspiration. Instead of cursing the care of these family heirlooms I decided to give them new life as subjects for some paintings. I love painting reflective surfaces, hence so many landscapes featuring water, so why not paint silver and other shiny "stuff" around the house when confined to quarters. I had a great time with this! I have painted only four still life paintings and probably as many figurative ones. It is clear where my passion lies. I want to be outdoors and I want to paint what I experience there. Still, I was aware yesterday of all that can be learned from painting objects and the same can be said for people and animals. I think such work might enhance my landscapes and keep me from getting stale. So why didn't I do this during the winter? Well, I am sure there will be plenty of rainy days and blistering hot ones so stay tuned. If you would like to see more of my very few other still life, people and animal paintings please visit my website www.jeanschwartzpaintings.com. and click "People and Things" on the menu. 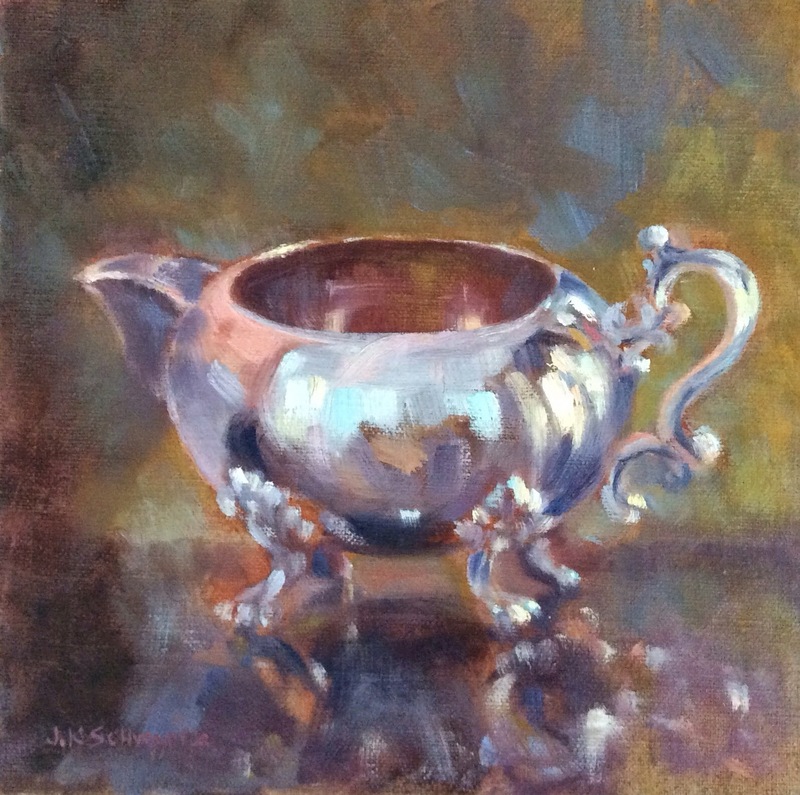 You may recognize this same creamer in the painting "Jesse Waiting". I hope you enjoy the visit! Here is the finished painting you saw in my last post while it was being painted from my rear deck last Saturday. 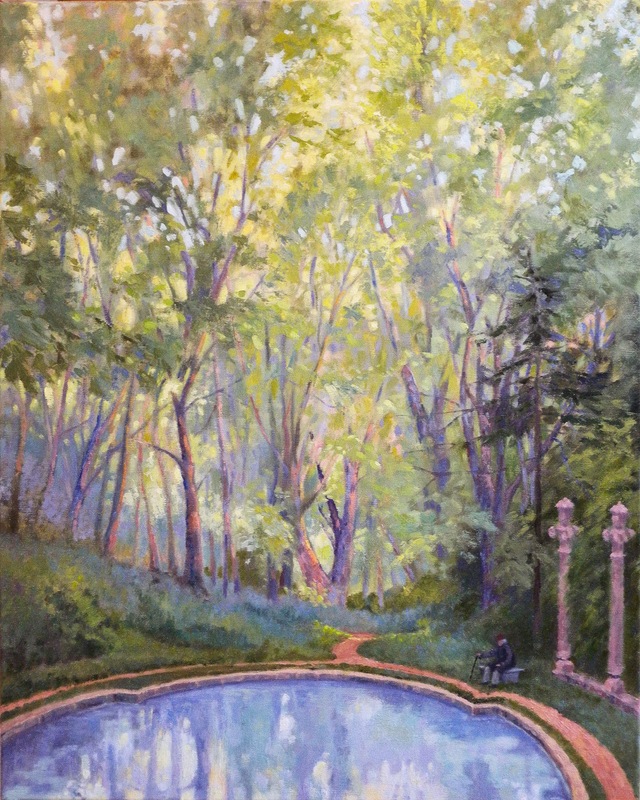 I had begun the painting around 4:30 and worked until 6:15 so I could get that late afternoon golden light. I felt I needed that as a foil to all the pink and blue and it would also accent the yellow of my daffodils under the tree. I was lucky this year as the light was just what I ordered. I have made painting this cherry an annual event and this is year three. My previous efforts are what led me to want either an early morning or late afternoon painting. Both of those times illuminate the tree in a beautiful way. I finished this yesterday and I am pleased with it. Last year's effort was a failure and was painted over. The year before was successful and it sold. This is the first plein air painting I have done on stretched canvas right out of the wrapper. I usually paint on primed panels that I have added a layer of gesso to followed by an underpainting of various colors. I had set up to paint on a 12x16 panel underpainted with yellow ochre when I realized what I wanted was a square. The only squares I had in the studio were the white canvas ones and all were still in their wrappers. So be it! Happily the paint set up well on the canvas by which I mean it didn't sink into the surface and look dull as it dried. The only adjustment I made was to cover the surface well and not let the white of the surface come through. Usually I want the surface color to show through in places having chosen the underpainting for that purpose. This weekend was spectacular! All the more so because it was a brief gift and we are heading into rain and cooler temperatures. I crammed as much into the two days as I could and the only time I spent indoors was at the end of the day. I rode my horse, painted outdoors and visited my favorite garden, Dumbarton Oaks in Georgetown. For those of you not familiar with Washington DC Georgetown is one of the oldest sections of the city and it is filled with wonderful Federal style homes and some of the finest gardens in the country. The painting above was painted a couple of years ago and it depicts a very charming corner of the garden. I remember that day well and while I was photographing the pool there were children running up and down the hill, people strolling around the pool but there was one figure that stood out. That was the man sitting by himself quietly contemplating the pool. Stories about him ran through my head and I knew this was to be a painting. Yesterday I was surprised to find the pool drained of water and some strange black, vertical fixtures sticking up from the floor. I was disappointed but something interesting is going to occur there. In May there will be a Landscape Symposium held at the garden and sound and scent will be added to this area. I don't know if that will be permanent but I will go back to experience it. 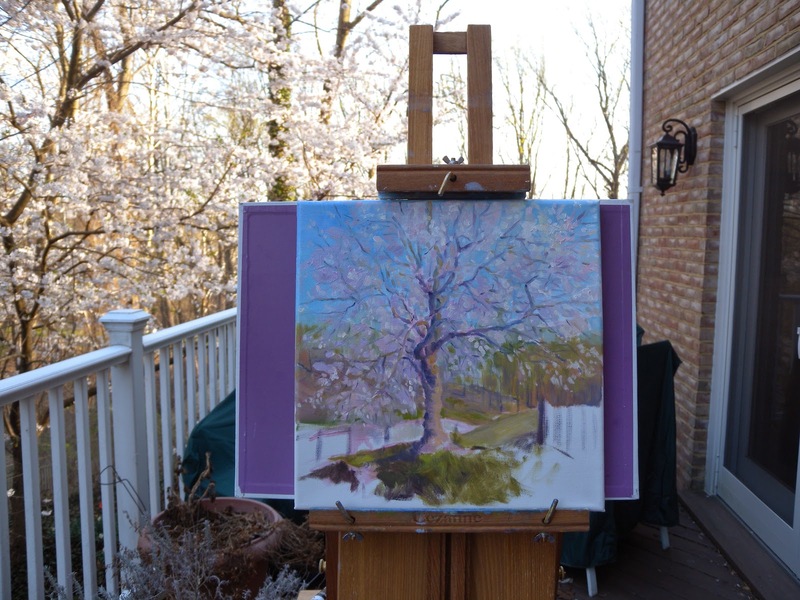 I never did make it to the Tidal Basin for the cherries but Cherry Hill at Dumbarton Oaks and my very own cherry provided plenty of pleasure and inspiration. Tourist season is in full swing and the traffic and parking situation was crazy. The line to get into Dumbarton Oaks was down the block and in all the years I have lived here this is the first time I have experienced that. Second Post for "Lafayette Square"
Here is the latest incarnation of "Lafayette Square" after I worked on it yesterday afternoon. 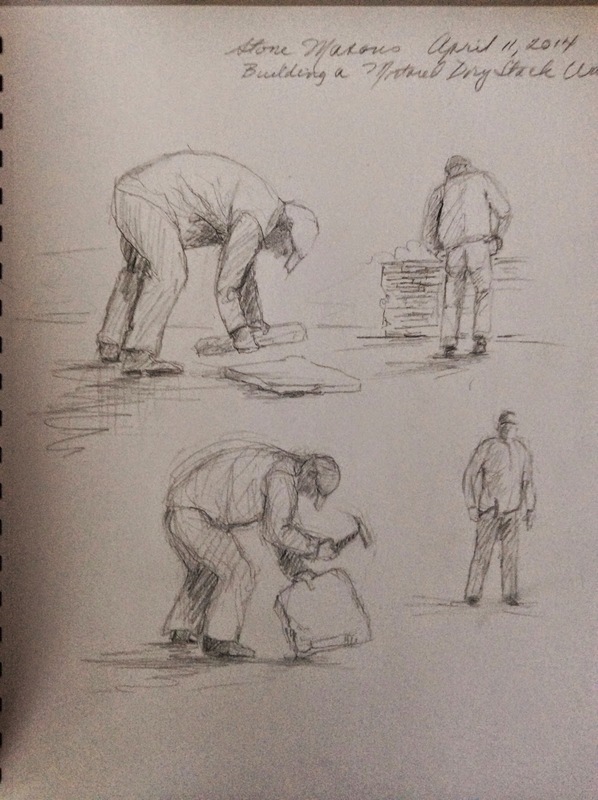 If you compare it to the last post you can see at least one of the figures I have decided on (selected from the sketchbook figures I showed you) and can also see I have painted out another. I made a few minor alterations around the painting and quit before having to turn on the studio lights. I had gotten a late start because yesterday and this weekend are going to be outdoor days for me. The weather is spectacular and Spring has arrived in full force, bursting out as soon as the temperatures soared into the 70's and 80's. I get really excited in the spring and the ephemeral aspect of it instills a sense of urgency in me. I don't know where to go first! Fortunately I don't have to go far and I have worked out a plan for the next few days. Today,after giving my mare Gypsy her first bath of the season, I will come home and paint in my rear garden where I will be standing under a canopy of pink and white blossoms. My cherry and pear trees are huge, mature trees and are truly magnificent. The pears have grown in such a way that they form a large Gothic arch where the converge. This is my favorite season, I am so inspired by it, however, I find it ironic that it is the most difficult one for me to paint. 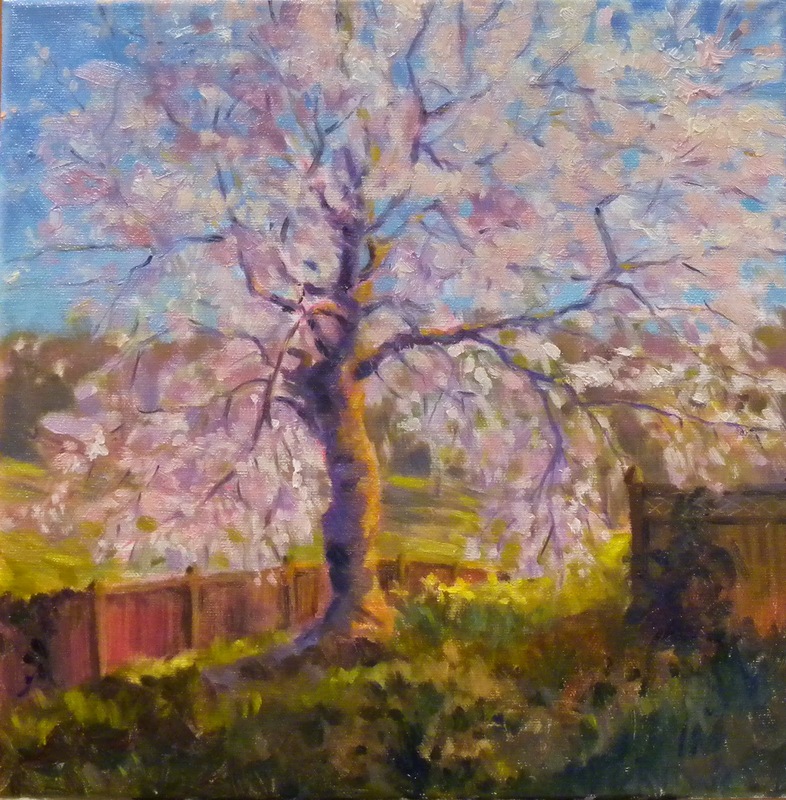 I have only done one cherry tree painting that has pleased me. Still, each year I rise to the challenge and Mother Nature is giving us warmth and sun this year to make that possible. I believe everywhere is beautiful in the spring but I must say that Washington DC is particularly so during this season. Tomorrow I will head to the Tidal Basin to photograph our world famous cherry trees. Traffic will be insane but it will be worth it. By Tuesday they will be gone as we are expected to have wind, rain and cold. That said I feel compelled to squeeze in a trip to my favorite garden in DC, Dumbarton Oaks. That will be on Monday and the forsythia display there is unique and stunning. I had better check my yellow paint supply! I will leave you with another page from my sketchbook. I had stone masons working in the rear garden this week replacing a retaining wall beneath the cherry tree. It was a nice opportunity to add to my "figures for paintings" collection. These men were true artisans and the stone wall they built is a beauty. The image above is the beginning of my most recent studio painting. I started it a couple of days ago and have only worked on it a couple of hours at a time. This is the struggle period and I am still changing a lot of things. There is a great deal of the peachy colored under painting showing through and it is not helping me at this point. I will be better able to proceed when I get that rather orange patch on the right worked over. I am concentrating mostly on the light and shadow right now and getting the scale relationships worked out. I conceived this painting last September while on one of my sketching and photo taking walks downtown. Lafayette Square is the park directly across from the front of the White House. 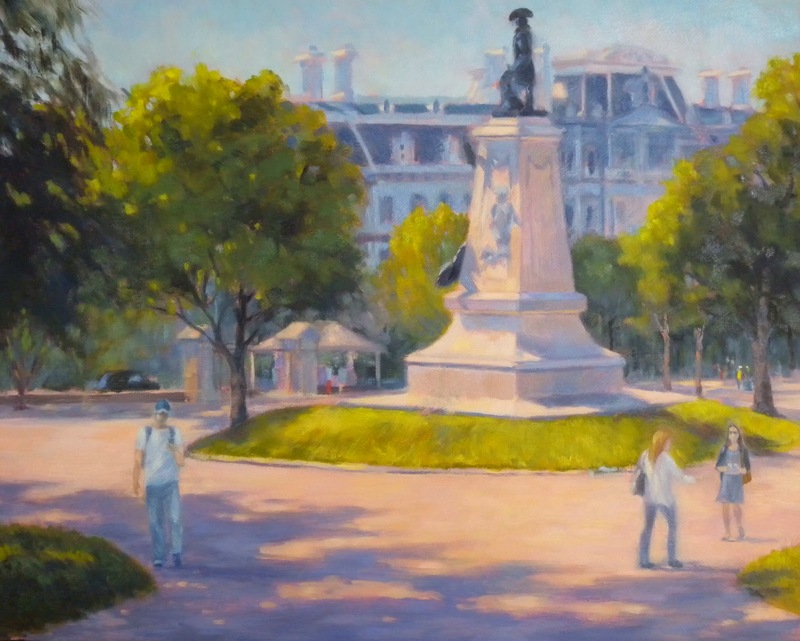 The huge Second Empire building in the painting is the Old Executive Office Building ( now called the Eisenhower Executive Office Building) and it is to the right of the White House. Mark Twain once called it the ugliest building in America. I don't know about that but I can tell you it is a complicated one to paint. I must be careful not to get pulled into the details of it! The time of year is September and the oppressive heat and humidity of the summer have begun to lift making the sky appear an aqua blue and the light, still filtered by the atmosphere, bathing the city in a warm, golden glow. That is why I chose such a warm color for the underpainting. 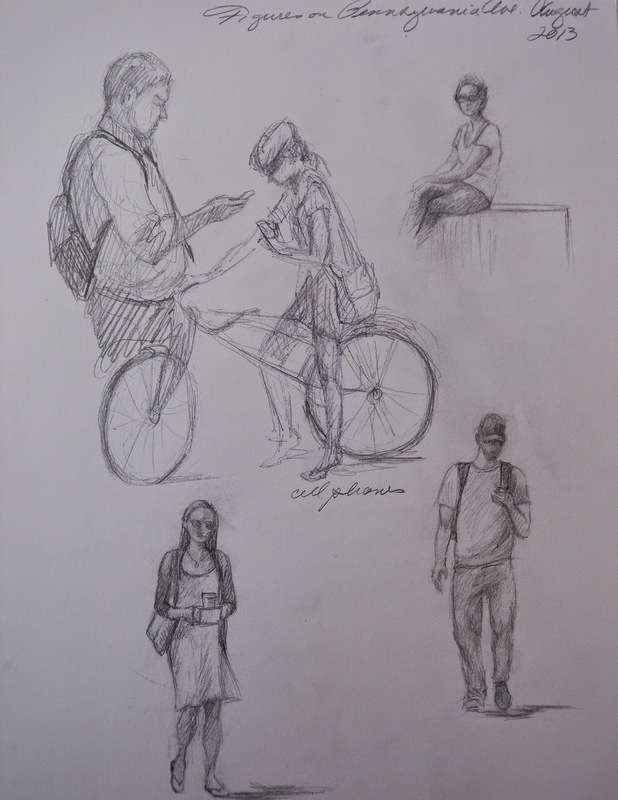 I have roughly sketched in some figures and I will be choosing those figures from my quick sketches of people downtown. Below is a page of those "city people" sketches. Check back in a couple of days to see which ones I choose.